You've done a great job on the restoration! Don't you love it when the shadows fall into place and you can really see the image for what it was? I find it rather thrilling. When I look at the recent street view it's hard to see that there's enough room for a tram! I love the blue paint job on the modern image. Very classy. It is not only old images that can transport you back but place names also. 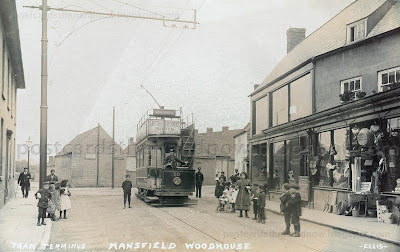 I had not thought of Mansfield Woodhouse for decades but on reading your post I was instantly transported back to Sheffield railway station and hearing the long list of stopping stations on departing trains. How I would love to travel back to ride on the tram and to browse round the shop with the baskets etc hanging up! What a great postcard. The goods hanging up outside the hardware shop are fascinating in themselves. That is the most interesting picture. The stone house, the kids, the double decker tram; the shops. Wow! What a fun and interesting postcard! I love the detail. You did a great job restoring it. I'd love to prowl around in that shop -- all manner and kind of things to buy! Great old postcard, and fascinating to see the same place now! A well restored card. Obviously we don't know how well you did this because we don't know the original. But it certainly looks great! That is such a great shot with all the children standing around. Imagine the photographer trying to get them to all stand still. I think they were better back in those days to take photos of everyday situations for postcards! A super photo, Howard, and another accidental preservation of shop buildings that seem more deserving of demolition. I like the boy standing in the street next to the tram. The tram drivers must have attracted the attention of many a boy's daydreams.